At SPS IPC Drives Italia 2017, in Parma, Delta showcased its complete portfolio of next-generation industrial automation products and solutions designed to augment the productivity of manufacturing and industrial processes in a broad spectrum of applications. These include the new compact modular mid-range PLC AS series, featuring slim and modular design with max. 1,024 I/O and remarkable programme capacity of 128K steps for multi-axis control to support advance automation machinery, as well as the new ASDA-A3 servo system, boasting a high performance motor with 6,000rpm and a vibration suppression function to enhance the operation integrity of advanced machines. Newly-launched and highly competitive solutions displayed at Delta´s Hall 5, stand A022 this year will include Programmable Logic Controllers (PLC), a new PLC AS Series which offers exceptionally powerful 32bit SoC (System on Chip) CPUs to perform up to 40Ksteps/ms in advanced automation machinery. Its compact, rack-less modular design allows for flexible and cost-effective expansion as it manages up to 32 extension modules or a maximum of 1,024 I/O points. The AS series PLC can control max. 8 axes via CANopen motion protocol and up to 6 axes through 200kHz pulse control. EtherNet/IP and other communication protocols are also available. AC Servo Systems and Motion Controls are Delta´s newly-launched ASDA-A3 servo system, which offers superior operating integrity for high-precision applications with its vibration suppression function and system diagnostics capabilities. Its high-calibre motor performs at speeds as high as 6,000rpm and with a maximum of 350% peak torque. The ASDA-A3 servo system is able to control 3rd-party permanent magnet synchronous motors with EnDat 2.2 and Bisc-C encoders. Delta´s linear stages and a series of planetary gearboxes will also be showcased during SPS Parma 2017. 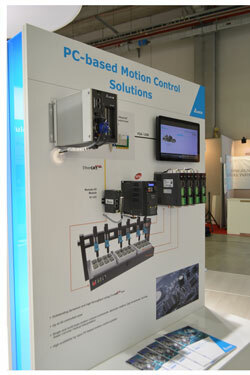 PC-based Motion Control Solutions, also includes a comprehensive ecosystem for the control of up to 64 axes through the integration of Delta´s new PC-based Host Motion Controller MH1 series, the Standard EtherCAT Motion Control Card PCI-L221 series, the compact high-performance drive MH300 series and the AC Servo Drive ASDA-A2-E series. With the PCI-L221 motion control card, the MH1 Series can achieve up to 100 units of EterCAT modules and 64 servo axes of motion control between 1-0.125ms cycle time. The system enables a whole set of motion control commands such as absolute, relative, jog movements, linear, circular and helical interpolation. Delta provides one-stop purchase with complete product lines and fully integrated systems for your motion control solution. CNC Control Solutions are also another highlight as Delta is unveiling two different CNC Control Solutions architectures at SPS Parma 2017. The PC-based CNC Solution: a controller enabling managing 6 axes and up to 4 interpolated axes via EtherCAT which makes it a preferred choice for applications such as thermal cutting and glass cutting. The system was designed for hardware integration allowing for Delta´s PC-based Host Motion Controller MH1 series, AC Motor Drive ASDA-A2-E and the High-Performance Compact Drive MH300 series to be integrated meeting high precision requirements. Open CNC Solution is an option that allows for the management of 4 axes with 4 interpolated axes through the integration of Delta´s own Open CNC Controller NC30E series, AC Servo Drive ASDA-A2-F series and Spindle Motor Drive ASDA-S-N series. In addition, permanent magnet spindle or 3rd-party induction motors can also operate under Delta´s Open CNC Solution. Horizontal Flow Wrapping is a solution capable of facilitating the control of as many as 32 axes in horizontal flow wrapping machines through the embedded EtherNet/IP and EtherCAT protocols, is a living proof of Delta´s growing capabilities in system integration as it combines the newly-launched HMI DOP-100 series, the hot swappable Motion Controller AH10EMC series, Remote I/O modules R1-EX series, the AC Servo Drive ASDA-A2-E series and the High-Performance Compact Drive MH300 series. Customers can benefit further by utilising the valuable and quick global data access and storage enabled by Delta´s DIACloud Cloud Management Platform. Industrial Internet and Cloud Solution, DIACloud, is a powerful and highly effective platform to enable secure and remote access to field data from PLCs and HMIs anywhere in the planet. Our own Industrial IoT (IIoT) routers, the Industrial Ethernet Cloud Router DX-2300LN-WW series and the Industrial 3G Cloud Router DX-2100RW-WW series, are the backbones of Delta´s cloud service with data widely available through a series of channels, including the DIACloud app (iOS, Android).